Shepard Smith, who was recently feuding with Hannity, was on Fox News when the revelation was made that Hannity also was a client of Trump's attorney Michael Cohen. "For us, the elephant in the room is that Sean Hannity is said to have been a third client of Michael Cohen,” Smith said in briefly addressing the bombshell news, adding: "A lot of people here know his number. We’ll get on that.” After a commercial break, Shepard said, "we spoke with his publicist here at Fox News who says that he says they have been friends a long time. He never denied he was his lawyer. That he did some legal work for him along the way. And that’s the extent of that." Hannity later released a statement saying "Michael Cohen has never represented me in any manner. I never retained him, received an invoice or paid legal fees." 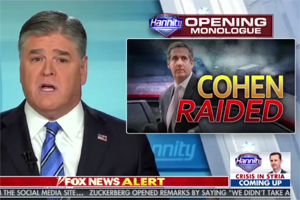 Fox News has yet to formally comment on Hannity's connection with Cohen. Jimmy Kimmel's wife/co-head writer Molly McNearney "Can't. Stop. Laughing." Seth Meyers on the Hannity revelation: "As someone who hosts an hour of television a night, I can’t IMAGINE also hosting three hours of radio in the afternoon. WHY ISNT ANYONE TALKING ABOUT THAT???"